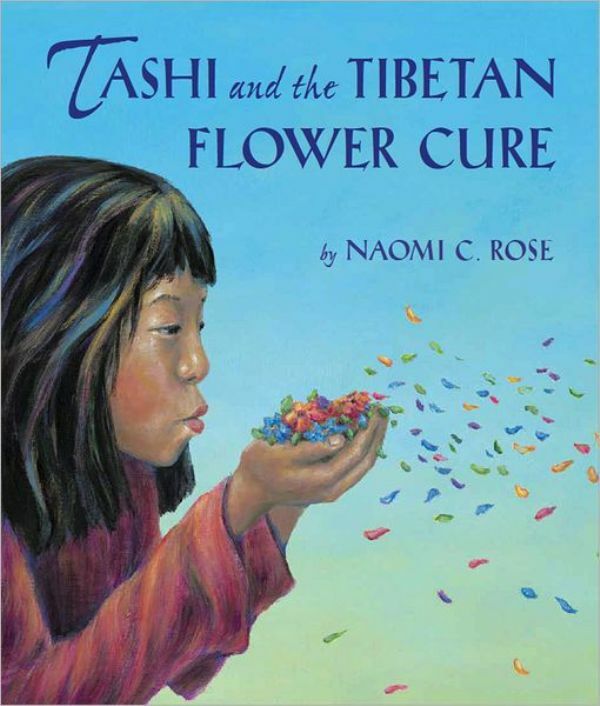 A merry heart does good like a medicine, it really does, and artist/illustrator Naomi C. Rose proves just that in her touching 2011 picture book, Tashi and the Tibetan Flower Cure. In this beautifully-written tale of a charming Tibetan tradition, Tashi is worried about her Popola—Tibetan for grandfather— who is suddenly taken ill and coughs all the time. She wracks her brain to figure out what to do or say to chase away the faraway look in Popola’s eyes and make him feel stronger. Then she suddenly remembers a Tibetan “flower remedy” Popola told her about, where sick people in his Tibetan village would sit downwind of flowers and let themselves be dusted by the pollen until they became well. Tashi immediately gathers flowers for the remedy, and even persuades the owner of a local flower nursery to allow Popola to sit downwind among his many flowers so the pollen can dust his body. Tashi does everything right, but Popola barely makes progress…until the other nursery visitors pitch in to help. They bring flowers and wind socks, a pillow for Popola to sit on, and smiles and conversation to pass the time. From this sweet attention, Popola’s smile grows wider, his cheeks grow rosier, and his body grows stronger and stronger. He’s getting better, but exactly which part of the tradition did the trick? I could tell you, but…I don’t think I will. I think you’ll have more fun finding that part out for yourself! Tashi and the Tibetan Flower Cure is a heart-warming book about homesickness, family, and the power of friendship and kindness. The sentences flow with a lilting sweetness, and the author, who is also an award-winning illustrator, uses soft pastels to put a colorful twist on the unbreakable bond of love. Readers of all ages will identify with the closeness between grandfather and grandchild, and I believe they’ll also appreciate experiencing this rare slice of Tibetan culture as much as I did. For a book with just the right amount of pollen to dust your heart and soul, be sure to read Tashi and the Tibetan Flower Cure.